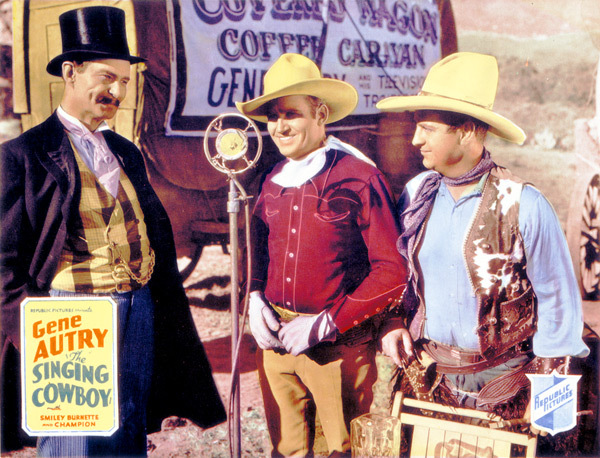 Gene Autry becomes the guardian of little Lou Ann Stevens when her father is killed by his shady partner, Martin, who has secretly discovered a rich goldmine on their ranch. Heir to her father's share, Lou Ann is seriously injured in a stable fire and needs a life-saving brain operation. To raise the money for the procedure, Gene, and his pal Frog Millhouse, organize a hillbilly orchestra and convince the President of the Covered Wagon Coffee Company, Henry Blake, to sponsor them on a tour to be broadcast via the new medium of television. Blake's daughter, Helen, runs away and joins Gene's orchestra as an amateur without telling them who she is, causing problems for her father. The doctor tells Gene that Lou Ann needs surgery immediately, so he borrows money against his contract. To take full possession of the ranch, Martin realizes he must stop Gene. Martin's gang steals Gene's wagon, halting the broadcast and ruining Gene's contract, thus threatening his loan. Gene rides all night searching for his wagon, making a surprise visit to the ranch and finds Martin, preparing for a getaway. Gene arrests Martin and turns him over to the sheriff, ensuring a successful operation for Lou Ann.